, a celebrated painter, was born at Caravagio, a place in the Milanese, in 1569. His father was a mason by trade, and employed him in making paste for the fresco-painters in Milan. The habit of being constantly among, painters, and seeing them work, produced in him a taste for that art, and without a teacher, without studying eitjier antiques, or the master-pieces of the moderns, he became a great painter. He employed himself entirely in making portraits for four or five years. He found nature the surest guide in his art, and he followed her with a servile obedience. He painted solely after her, without any selection, the beautiful as well as the ordinary; and copied her very defects. On being once shewn some fine antique fig ires, “See,” said he, pointing to the bystanders, “how many more models nature has given me than all your staiuos!” and went immediately into an alehouse, where he painted on the spot a gipsy who happened to be in the street, so as none could find any thing to correct in it. It was difficult to be upon good terms with him. He was naturally quarrelsome, despised every one, and found no performances good but his own. A man of this temper could not be long without enemies. Some business that he had at Milan obliged him to leave this city, and make a journey to Venice, where he adopted Giorgioni’s manner. His stay here was but short, and he repaired to Rome. He was in such poor circumstances, that he was forced by necessity to work for Josehino, who gave him fruit and flowers to paint. This department was not that wherein he excelled; he therefore left Josehino, to go and paint large figures for Prospero, a painter of grotesque. Prospero every where sounded his praise, and made considerable profit by his works. A picture, the gamester, that Caravagio had painted, so highly pleased the cardinal del Monte, that, having bought it, he requested to see the artist, and kept him in his palace, where he caused him to paint several pieces for the pavilion in his garden. All the walls of the work-room of Caravagio were blackened, in order that the shades of objects might have no reflections, and all day long only one light entered it | through the uppermost window. Thus he succeeded in giving his pictures that dimness and strength, which, at first sight, excelled and eclipsed all others. 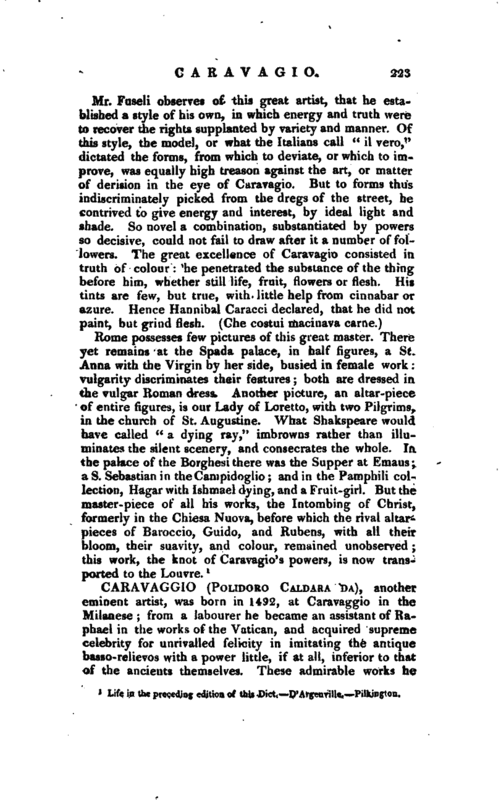 Even Rubens himself acknowledged Caravagio to be his master in the clar-obscure. Caravagio gave all his objects so striking and extraordinary a truth as could not be exceeded, and it was not possible to carry the natural any farther. But all these beauties disappeared in large compositions: his style was then hard and insupportable. He placed his figures all on the same plan, without gradation, without perspective; and his light to every object is uniformly thesame. All the painters of the time combined against Caravagie: they objected to him that he had neither genius, nor propriety, nor grace, nor sagacity, and that he knew not how to make a good choice; and it is certain that his figures are not noble. He used to paint the porters, who served him for models, without their heads, which he afterwards put on according to the saints, heroes, and other great personages they were to represent. The altar-pieces that he executed for churches and monasteries were obliged frequently to be taken down again from their places; this was particularly the case with a St. Matthias, who, instead of a haggard old fellow, looked like a jolly clown; and the Death of the holy Virgin, who had the appearance of a low drunken woman. But all these affronts were unable to correct him. At last, all the painters, following the stream of the fashion, imitated his example. 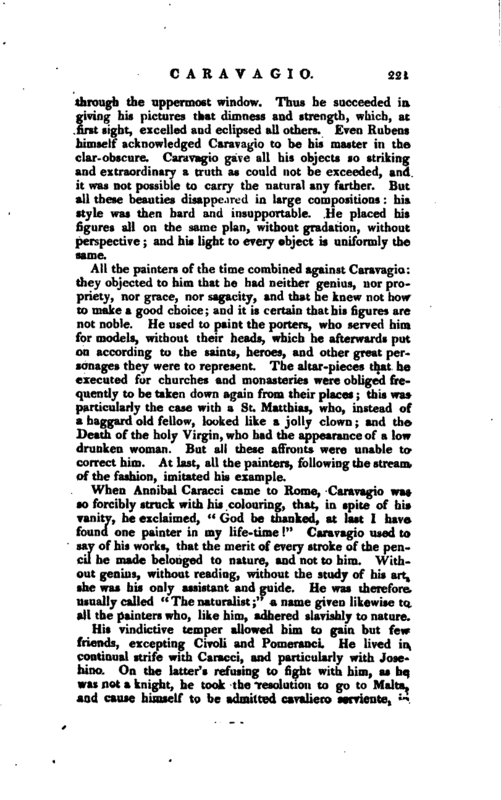 When Annibal Caracci came to Rome, Caravagio was so forcibly struck with his colouring, that, in spite of his vanity, he exclaimed, “God be thanked, at last I have found one painter in my life-time!” Caravagio used to say of his works, that the merit of every stroke of the pencil he made belonged to nature, and not to him. Without genius, without reading, without the study of his art, she was his only assistant and guide. He was therefore usually called “The naturalist;” a name given likewise to all the painters who, like him, adhered slavishly to nature. His vindictive temper allowed him to gain but few friends, excepting Civoli and Pomeranci. He lived in continual strife with Caracci, and particularly with Josehino. On the latter’s refusing to fight with him, as he was not a knight, he took the resolution to go to Malta, and cause himself to be admitted cavaliero serviente, in | order to compel Josehino to give up all farther evasion. He killed a young man at Home, with whom he quarrelled at tennis, and fled, though sorely wounded, to Zagaroles, to the duke Maria Colonna, from thence to Naples, and afterwards to Malta. 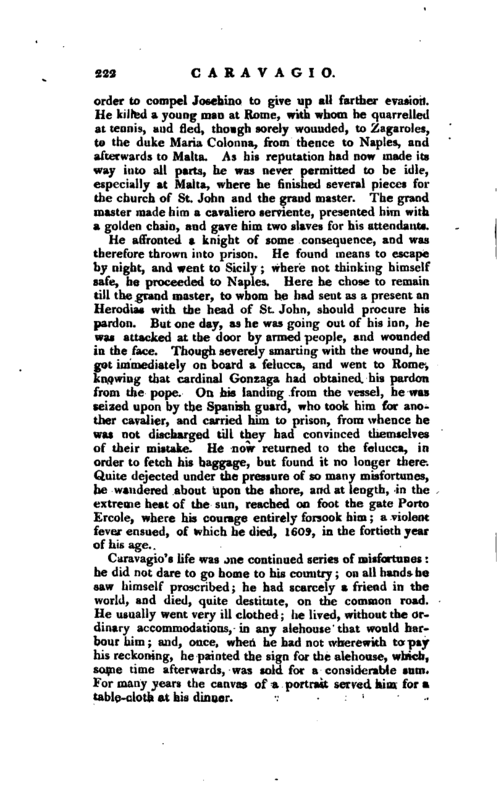 As his reputation had now made its way into all parts, he was never permitted to be idle, especially at Malta, where he finished several pieces for the church of St. John and the grand master. The grand master made him a cavaliero serviente, presented him with a golden chain, and gave him two slaves for his attendants. He affronted a knight of some consequence, and was therefore thrown into prison. 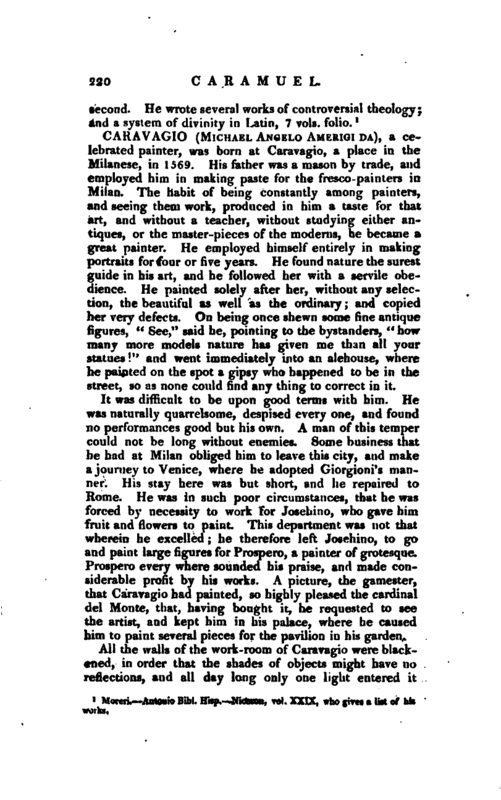 He found means to escape by night, and went to Sicily; where not thinking himself safe, he proceeded to Naples. Here he chose to remain till the grand master, to whom he had sent as a present an Herodias with the head of St. John, should procure his pardon. But one day, as he was going out of his inn, he was attacked at the door by armed people, and wounded in the face. Though severely smarting with the wound, he got immediately on board a felucca, and went to Rome, knowing that cardinal Gonzaga had obtained his pardon from the pope. On his landing from the vessel, he was seized upon by the Spanish guard, who took him for another cavalier, and carried him to prison, from whence he was not discharged till they had convinced themselves of their mistake. He now returned to the felucca, in order to fetch his baggage, but found it no longer there. Quite dejected under the pressure of so many misfortunes, he wandered about upon the shore, and at length, in the extreme heat of the sun, reached on foot the gate Porto Ercole, where his courage entirely forsook him a violent fever ensued, of which he died, 1601, in the fortieth year of his age. Life in the preceding edition of this Dict.—D’Argenville, Pilkington.